A Child Marriage Awareness Panel, an event as part of a series of panels intended for women refugees, was held on the 28th of September, 2017 in Mersin. The panel content concept of which was developed by the United Nations Population Fund (UNFPA) was organized in cooperation with UNFPA in Turkey’s implementing partner the Association for Solidarity with Asylum Seekers and Migrants (SGDD-ASAM). The series of panels aims at raising awareness of and draw attention to child marriages, a serious human rights violation against children, also a significant problem among refugee families in Turkey. In the panel, participants held presentations with the themes Physical, Psychological and Social Dimensions of Child Marriages, Legal Status and Obligations in Early Age Marriages in Turkey and Child Marriages from the Islamic Perspective. The Child Marriage Awareness Panel, which was organized with the cooperation of the United Nations Population Fund (UNFPA) and the Association for Solidarity for Asylum Seekers and Migrants (SGDD-ASAM), was funded by European Civil Protection and Humanitarian Aid Operations (ECHO), a unit operating under the European Commission. In the panel held in Mersin 200 refugee women participated. In his opening speech İlker Cece, East Anatolian Regional Coordinator of the Association for Solidarity with Asylum Seekers and Migrants (SGDD-ASAM), said that the Association of SGDD-ASAM has been active since 1995, executing projects intended for refugees seeking a helping hand in Turkey so as to promote their social adaptation and enhance their access to rights. Mr. Cece further said that they have found in field surveys carried out by SGDD-ASAM that child marriage is one of the most serious problems besetting communities, and that such marriages give rise to problems which might pose irreversible threats. 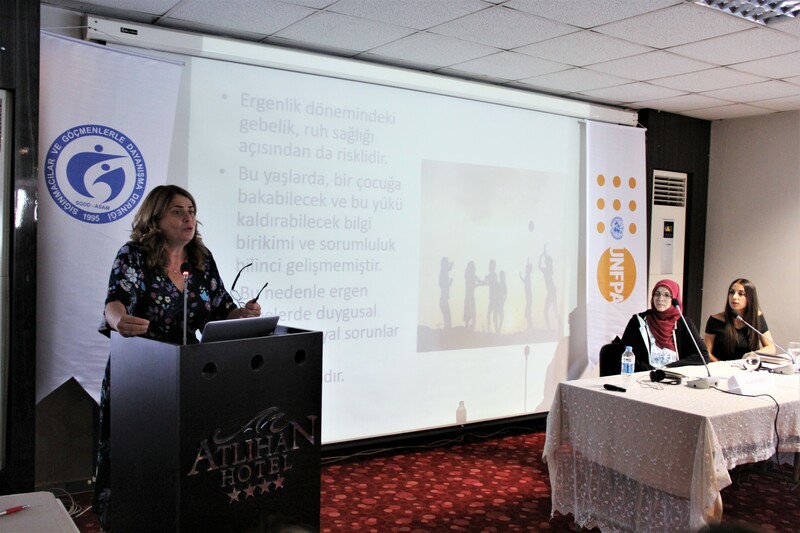 Gül Erdost, Women Empowerment Expert from United Nations Population Fund (UNFPA), said in her opening speech that UNFPA aims to carry out activities in Women and Girls Safe Spaces in 17 provinces (the number of centres will reach 41 until the end of this year). Among the refugee women who patronize these centres, especially underlining that child marriages and pregnancy stand out as the most prominent problems. Drawing attention to the high frequency of problems observed in the field, Erdost said that in April they launched this series of panels intended for women and men refugees in an effort to raise awareness in this issue and further mentioned that with over 30 panels to be organized within this concept, they aim to reach thousands of refugees. Dr. Ful Uğurhan, President of the Chamber of Medical Doctors of Mersin, who made a speech on the theme Physical, Psychological and Social Dimensions of Child Marriages, said that while the UN Convention on the Rights of the Child defines every individual under 18 years of age as a child, the World Health Organization, on the other hand, defines the age range of 0-10 years as childhood age and that of 10-19 years as adolescence, and declares that individuals in these age ranges are not considered to have fully developed in respect of physical, spiritual and social terms. In her presentation Dr. Uğurhan especially underlined that delivery in girls between 15-18 years poses great risks to their health that can lead to mortality, with high incidence of sexually transmitted infections, serious bleedings in the post-natal period and high risk toxaemia during pregnancy. She further pointed out that a high mortality rate is reported among mothers and infants as a consequence of the health problems arising from early marriage of girls. Sibel Şat, lawyer and office manager of the Association for Solidarity for Asylum Seekers and Migrants (SGDD-ASAM) in Hatay, made a presentation on the theme Legal Status and Obligations in Early Age Marriages in Turkey. In her presentation she said that child marriage is a violation of human rights and also a criminal offence. Referring to Article 6 of the Convention on the Rights of the Child, she pointed out that the states has the obligation to prevent child marriages and enact laws to impose punishment on individuals who are involved in such marriages. Underlining that Turkish Criminal Law defines an unofficial marriage with individuals of child age as a criminal offence, she said that sexual contact with a child is an act of sexual abuse that is to be punished with imprisonment, further mentioning that Turkish Criminal Law stipulates a sentence of imprisonment from 8 to 15 years in such cases, with a minimum imprisonment of 10 years in cases where the involved child is under 12 years of age. Nesrin Semiz from Capital City Women’s Platform who made a presentation with the theme Child Marriages from the Islamic Perspective drew attention to the fact that Quran imperatively stipulates that individuals who would get married must be of good health and with ability to make sound judgements. She underlined that Islam also stipulates that individuals who wish to get married should have a certain educational background. She further said that in order to interpret the stance of Islam on any matter one should consider in the first place whether or not it poses a threat for human health and have negative effects on the social order. One of the women refugees who took part in the panel shared her experiences. She said that she was married at early age when she was 16 years old, as a result of which she suffered a lot from the impacts of early marriage and bore her first child 10 months after she was married. She had to assume the responsibility of a whole household and that of a new-born and fell into depression because of the difficulties she had to go through, said she with emphasis. She further said that doing household chores all day long she could not complete her education and has always had a hard time due to the fact that she was not able to learn any profession. In conclusion, she stated that she did not want her daughters to experience the same problems and expressed her wish to support them to complete their education. The United Nations Population Fund (UNFPA), with support of its various implementing partners and with the finance received for various international donors, continues to organize "Child Marriage Awareness Panel" series of nearly 30, whose content is specifically developed for men and women, in many different provinces of Turkey.